Increase the number of applications to your job ad by posting it on Monster and across hundreds of targeted websites. 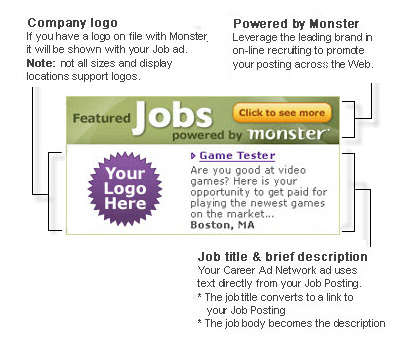 Enhance your Monster Job Posting with targeted advertising on the Monster network and on Monster's diverse partner websites. Enhance your Monster Job Posting with targeted advertising (up to 150,000 "page impressions") on hundreds of Ireland's top websites where qualified job seekers spend their time online. When job seekers click on your ad, they'll be brought to your Monster Job Posting, where they can learn more about the job and apply online. How does CAN help me recruit? Simply put, CAN increases the number of times your job ad is viewed and the number of applications – in many instances by up to 50%. A Career Ad Network ad consists of a job title, a brief job description, and a company logo. The information in your ad comes from your job posting. Just post your job and we’ll do the rest. Play the video above to see a sample ad. The size and appearance of your ad will vary depending on the placement. For further information, advice or assistance, please call 1 800 509 659 to speak to a Monster representative. Once you have purchased Career Ad Network, you can easily apply Career Ad Network as part of the job posting process. Just select Career Ad Network as a Job Posting Enhancement when you post your job. Do you anticipate more hiring in the future? You can save time and money by purchasing Career Ad Network units in advance, then apply them when you post a job. When you use Career Ad Network, no additional information is required to create your ads, and there are no online forms to complete. Just post your job and we'll do the rest. Note: In order to use Career Ad Network, a Job Posting is required.